I recently picked up a MSI Radeon RX 580 DirectX 12 RX 580 ARMOR 8G OC (Hynix memory). I've followed the VBIOS that i found here (https://anorak.tech/t/msi-rx-580-armor-oc-8gb-hynix/5933/16) for this exact card....1:1750 and 1:2000 and 2:1750 and 2:2000 with overclocking 1200 / 2120 MHZ. This setup supposedly gives 29.5 MH/s as it has been confirmed from multiple people. However, I've only been able to obtain 27.2 MH/s. 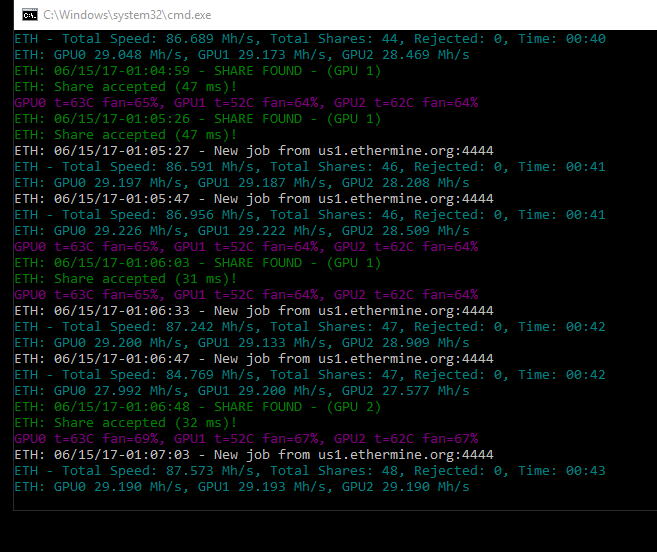 I'm using daggerhashimoto from nicehash on an inactivated windows setup. Any thoughts on why I can't push it to 29? Hello guys, I am sorry for asking such a simple question, but I am a complete noob at mining. If I buy asus strix rx580 8gb, which is not oc, will it be possibble to flash the bios? Will I lose warranty? No memory clock possible without a hashrate's drop. hello guys ,I am working 30.2 mhs with 5 cards in 2 weeks with solomining. What happened yesterday, all the cards dropped to 29, what is the reason for this. All cards shapphire rx 580 nitro + 8gb oc. I am using Claymore 9.4 on windows 10. Dzembo77, will you post your settings? Did you use a particular ROM? I can't get my 6x MSI 4GB 580's to go beyond 25Mh/s without crashing. Its because your strap in the higher slots is wrong. Its not running the say 2:2000 slot until under load and at 2000mhz, strap is settings for that , really you only need the :2000 field set to a good strap the your set. Guys today i pick up my new RX 580. And make some test. Anyone have better ? pls repl i just start today with test. I have looked at your bios and your straps are tighter than any of mine and hence why your hashrate is higher. I think if you want higher then you need tighter straps. Can you please confirm that your memory is Hynix ? Also when you ran the memory at 2250 there were no memory errors in HWINFO ? at over 11 h 54 mins .. still working. Well when i do -cvddc 850, -mvddc 850 Claymore crush and frozen system . so i use MSI. - 96 VOL. Do u have any sugestion to make beeter has with power ? Some mate publish here 35 mhs per 96 wats ..
Hey guys, can somebody confirm the thesis of this article? It is true as we are currently on Dag 130 and when I tested on Dag 199 I lost 13Mh/s. There are some important factors to consider here and these are. 1. My results on a 8GB were less impacted than the results by the person testing a 4GB card. 2. How quickly the DAG file changes and I need to research this. 3. When my Hashing rate slows so will everyone else's so only people with 8GB+ memory may benefit and this will be a small number of people. 4. The most important and unanswered question when will ETH switch to POS. At the moment the coin/owners like having us as we create noise and processing speed for the coin. My point being that it is dangerous for the coin not to support miners before they transition to POS. For all the people that are not getting the hashrate they are expecting. make sure you do not have your monitor hooked to the card as your main display. I use my integrated graphics as my main display. If I use one of my AMD cards to drive the display I instantly lose about 2-5MH/s. I just started mining couple of days back so I apologize in advance if I come off as a major noob. Followed everything online, tried first by adjusting the clock speeds on afterburner only to have the hashrate go down to 5. After going through a the forum, modded the bios and copied the straps from 1:1750 to 1:2000. Reprogrammed. Patched and restarted. Anyone else ever had to go through any of this? Would be a huge help if anyone had any suggestions. Thanks in advance! You were right, it was modded wrong. Had to copy the 2:1750 straps down to 2000 and 2250, I;m wondering if I should I do 1625 all the way down to test, has anyone tested and gotten it stable yet? i there, someone found a good mod for the Rx580 nitro Sapphire Gpu? i have 6 of them, Elpida and Hynix memory, original they hash 22,49 but i modified the core to 1260 and the memory to 2000 and they hash me 24 Mh/s and have good stability ---- i want to increase 2 or maybe 3 hashes more any advises? Hi, are there any user here of RX 580 MSI Gaming X? Can't seem to make it to 30 Mhs, just 28+ Mhs. My OC setting is 1150 Core, 2150 Clock, -96 mv at MSI Afterburner and also the bios is modded. I'll appreciate your help guys. I just a got my MSI RX 580 Gaming X yesterday and manged it to mod it to get around 29 to 30+ MH/S on Claymore 9.5. My OC are 1380 core and 2150 on Mem Clock after the Bios MOD. However, if I decrease the Voltage, my Cards crash ! Well...yeah. Of course your card will crash if you decrease the voltage on a 1380mhz core lmao. Anything over that the rig is unstable for me, what all did you mod to get 29-30 if you don't mind throwing out some pointers! I think I can also reach 29-30 with that 1380 core clock, however that power consumption is too high. :0 That's why I'm looking for any MSI RX 580 Gaming X (samsung) user that can reach 30+ Mhs with low power consumption.